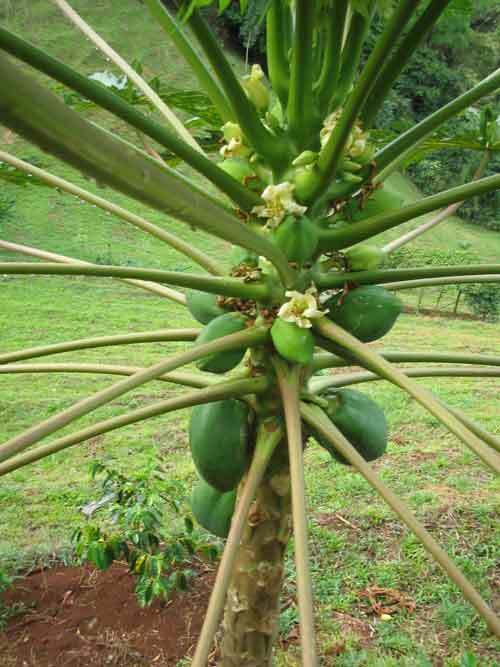 In the mountain areas papaya grows well, if lacking the size and sweetness of the hot coastal regions. 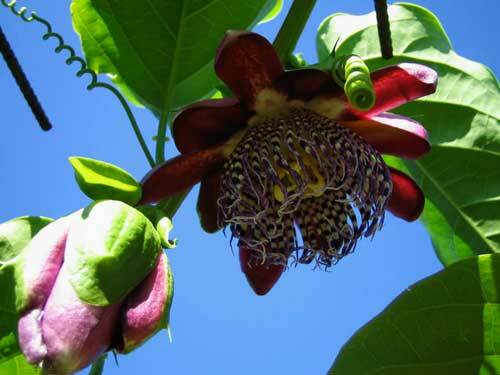 This is a fruit which can easily be grown from seed. You just put it in the ground and it takes care of itself from then on. In mountain areas there is a threat to fruit which is not present in the hot lowland areas: a wasp. This particular wasp lives at higher elevations only, and lays its eggs in the early developing fruit, basically destroying it. To avoid this the just emerging fruit is enveloped in a plastic bag to protect it from the wasp. Later on, as the fruit gets larger this is not such a menace and the plastic bag can be removed. here's an update: I've just learned that this is not a wasp at all, but a species of fruit fly which is perfectly camouflaged as a wasp! Right down to the sting at the back, which in this case it uses to inject its eggs into the fruit. Incredible! 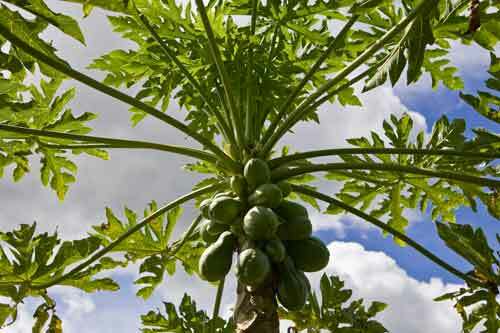 Papaya flowers developing into fruit. And the final result - Sangha Lila Papaya! 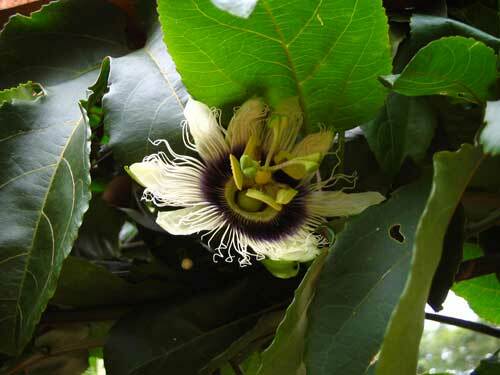 There are two varieties of passionfruit grown locally. 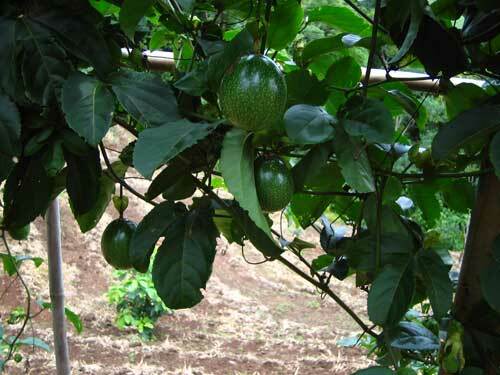 The more common type is a slightly sour variety called maracuya, which is used for making a 'fresco' or fruit juice. They generally add a little tapa dulse (raw dried sugar cane extract) to this to sweeten it up. We initially grew this vine over an overhead trellis, so the fruit would hang down and allow for easy picking. This turns out not to be the best way to do it. The grenadilla is a sweet variety of passionfruit with an amazing range of tropical flavours in that one compact package. To commercially grow either of these passionfruit vines one builds a series of posts with wire strung between them, similar to grapes. The vines just spread along them for long distances and the fruit is easy to harvest at waist level.